My very first Jess Haines and a YA/NA at that. Not my usual genre, but it's JESS HAINES! How can I resist?! 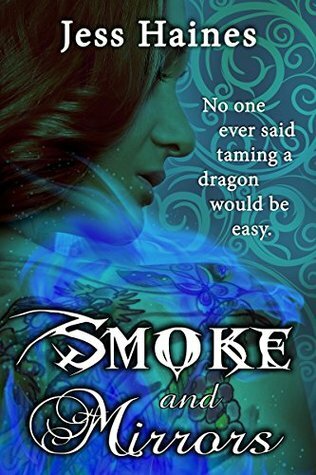 And I'm so glad that I'm a weakling because SMOKE AND MIRRORS is a light, urban fantasy filled with dragons, wyverns, centaurs, magi, sorcerers, and bigots to say the least (yes, I find bigots a form of a dark creature). Set in New York City, we follow Kimberly's last few weeks until she graduates from Blackhollow Academy. Thing is, Kimberly's final task is beyond passing finals and casting spells, how about bonding a proud, stubborn, domineering dragon? I haven't had the pleasure of reading JHaines' H&W Investigations, but she did tell me that SMOKE AND MIRRORS is set in the same world. I didn't see or meet Shiarra and/or Alec (yet), but I'm sure their fans will be pleased with this little tidbit. Smoke and Mirrors is set in the same world [as H&W Investigations] and general time frame, but it's completely different in tone and style. I'm also dipping a toe in the YA waters, which is new for me. Honestly, I'd classify it as new adult, but that carries all kinds of connotations that I don't think fit this story. Though Kimberly is 21, SMOKE AND MIRRORS feels very young adult in tone as JHaines mentioned. Perhaps it's due to the storyline itself and how much it focused on Kimberly's studies and family life it that didn't leave much room for violence or even romance? Bottom line is, I had fun with the story and enjoyed meeting the crazy cast of characters. And compared to other it a fantasy series, this one is very light in every aspect. Even the "romance" is muted, surprising considering what Cormac is. As a heroine, Kimberly is likable and what you'd consider a formidable underdog. She's yet to grow into her powers so she hasn't reached "badass" status yet. You can see it lurking in the surface, Kimberly is a quick study, loyal, and very protective of her mother, friends, and those who are at a disadvantage. I love the voice JHaines lent her and the way her character is set up leaves a lot of room for growth. Thank you, JHaines for inviting me to party with Kimberly and Cormac, I had a blast and I look forward to hanging out with them on their next adventure. I have a feeling that it won't be as easy as surviving Blackhollow Academy. I've been cutting way back on my NA but this sounds fabulous and I have yet to try this author. I think you've just convinced me that I need to! Jess has adult books too, right? I think so. Hmmm. It doesn't matter that it's YA though. Sounds wonderful! I'm actually REALLY interested in this book! Holy smokes, I love the premise!! Thanks for reviewing it!! I've never read any books by this author before. This might be a great intro, though. I'm glad you had a great time with this new book! I'm so curious! It's too bad that NA has come to mean just one thing. It's such a cool time in life. I think I'm going to give this one a try. Oh WOW! This sounds right up my alley! I hadn't heard of it yet but on the list it goes! A dragon? Yes, please! This book had me at dragons. You had me at fun. Oh yea, I do think I would really enjoy this one. This dragon is a little ornery and a tad snobbish too. Cute! oh this one sounds fantastic, and if I read YA I would get it. I will put it on my YA watchlist though, for when I am in the mood for it in the future. Dragon? And the YA aspect doesn't put me off so I'll have to add it to the list. The story and the world sound good. 2 YA reads in a row? Very nice, sis, lol! I saw "set in New York City" and immediately added this to my TBR. lol! I think bigots are lower than dark creatures. I haven't read anything by this author, but sounds like she did a great job with this book. I am glad to see the author made the crossover. Despite the characters feeling more YA this sounds interesting. And I'm even gladder she didn't turn this into an angsty NA fest. oi! Thanks for checking this out, brandee! For those asking, I do indeed write adult urban fantasy as well. Braine, I'm glad to hear you're inclined to read the H&W books! Jet me an email if/when you're ready to give them a read and I'll put you in touch with my publicist at Kensington. I haven't read Jess Haines before Braine, but this series sounds so good. I do like urban fantasy reads, so I think I'd like Kimberly. I haven't tried Jess Haines before, but I might have to try, because DRAGONS. LOL Great review.